GetDivorcePapers.com provides professionally completed, 100% court-approval, money-back guaranteed Iowa divorce forms. Just create an account, complete the interview, and file for divorce. 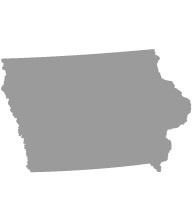 Our case managers do all the work for you, and send the completed Iowa divorce forms when they are ready to be filed. A filer has to be the resident of the Iowa for a year if he or she wants to file a divorce case. However, this condition rules out if the defendant spouse is the resident here and has received the papers in the county where he or she is residing. Severe illness either physical or mental in either of the spouses. Atmosphere in the houses of both the spouses. Association of the child with the family members. Willingness of each of the spouse to go in open relationship for the interaction of the child with the other spouse. Personalities and nature of parents. Age, health, and basic needs of the child. Decision making ability and strength of the child. Geographic location of the both the parents and the social circle of the child. Depending upon all these factors, court may give the sole custody to a single parent or a joint custody to both of them. Iowa divides the marital property between the two members equally without considering the reason of divorce in it. However, a little out of the marital property can be reserved for the child support of the minors. In this case, separate property of the spouses and their personal gifts are not divided at all. Moreover, income of the spouses and their contribution towards attaining that marital property are also taken into account. Iowa gives rights to the spouse who needs the support to live a better life or at least according to the standards that he or she had before the divorce. Therefore, court may ask either of the two spouses to pay alimony to the other partner who needs it. Amount of this support is determined after reviewing the expenses, income, and financial standings of the two partners. Court has all the rights to order either one of the spouse or both to pay for the child support for the proper care of the child. This amount is also determined after analyzing the needs of the child and the potential of the parents to pay for their child's expenses. Court may refer for the mediation on its own. For this, parents are required to attend the counseling courses. There is no need of a lawyer when applying for divorce in the state of Iowa. A divorce case which is filed without any help of an attorney in any of the states is known as Pro Se Divorce. Literally, Pro Se is a Latin phrase and it means "on her or his own". Process of getting the divorce without the help of lawyer may vary from one State to another. These types of divorces are perfectly legal and enforceable in Iowa, and are actually very convenient. Usually, once settlements have been made regarding property distribution and custody matters among the spouses in case of a mutual divorce, Pro Se Divorces are filed.